Biography Samuel Bernheimer, son of Simon and Bella Bernheimer, was born in Hohenems on September 12, 1812. He became a clerk at the age of twelve, and when he immigrated to the United States, he found employment in a mercantile business on Grand Street in New York City. He later moved to Charleston, South Carolina, and then to Liberty, Amite County, Mississippi, where he again worked in a mercantile business. Bernheimer married Henrietta Cahn (1827-1904), who was born in Germany, in New Orleans, Louisiana. 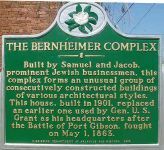 The Bernheimers were living in Port Gibson, Claiborne County, Mississippi, by April of 1847. Samuel Bernheimer soon opened his own mercantile business, which he at first operated out of his home. Union general Ulysses S. Grant later used the Bernheimer home as his Port Gibson headquarters during the Civil War. The Bernheimers had six children: Carrie, Clara (d. 1889), Jacob, Louis (b. 1848), Marcus, and Sidney. Besides general merchandise, Bernheimer sold imported luxury goods from Austria, England, Italy, and Switzerland. Between 1851 and 1852, Samuel Bernheimer formed a business partnership with his brothers, Adolph and Jacob, naming the firm S. Bernheimer and Brothers. Jacob Bernheimer died of yellow fever in Port Gibson on September 19, 1853, and he was buried at Grand Gulf, Mississippi. Shortly thereafter, William Cahn, a brother of Henrietta Cahn Bernheimer, was admitted to the firm, but after several years, he withdrew and established his own business elsewhere. Samuel Bernheimer owned one slave and property valued at twenty thousand dollars in 1860, and Adolph Bernheimer owned property valued at fifteen thousand dollars in the same year. Adolph Bernheimer left S. Bernheimer and Brothers to join his nephew in a mercantile store in Mobile, Alabama, in 1865. S. Bernheimer and Brothers suffered heavy financial losses during the Civil War. However, Marcus Bernheimer helped his father to recover from debt in subsequent years, and Samuel Bernheimer eventually retired from an active role in the business, allowing his sons, Jacob and Sidney, to take over its management. Samuel Bernheimer died on October 23, 1888. Nachruf auf Samuel Bernheimer "Samuel Bernheimer Deceased" 1888. Das von Samuel Bernheimer erbaute Haus fiel 1900 einem Brand zum Opfer. Jakob Bernheimer errichtete 1901 das neue Bernheimer Haus, das bis heute ein Landmark von Port Gibson darstellt.